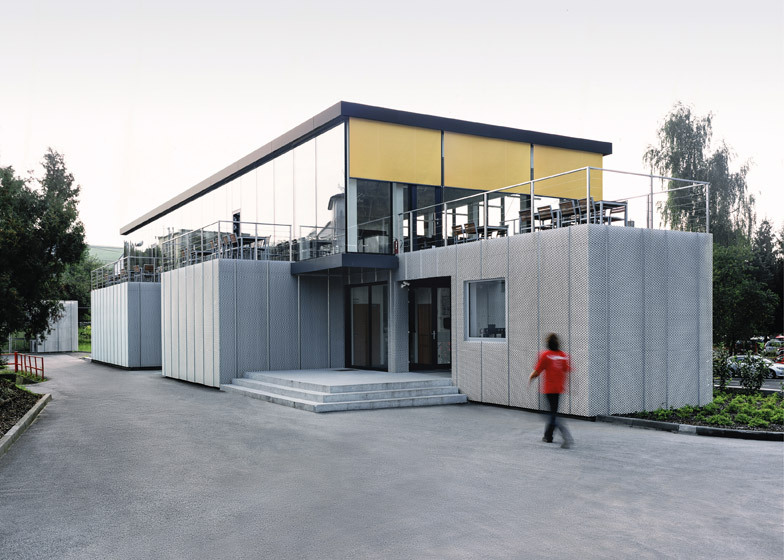 Chybik+Kristof Associated Architects stacked prefabricated construction modules horizontally and vertically to create this staff cafeteria at the factory where they are produced (+ slideshow). 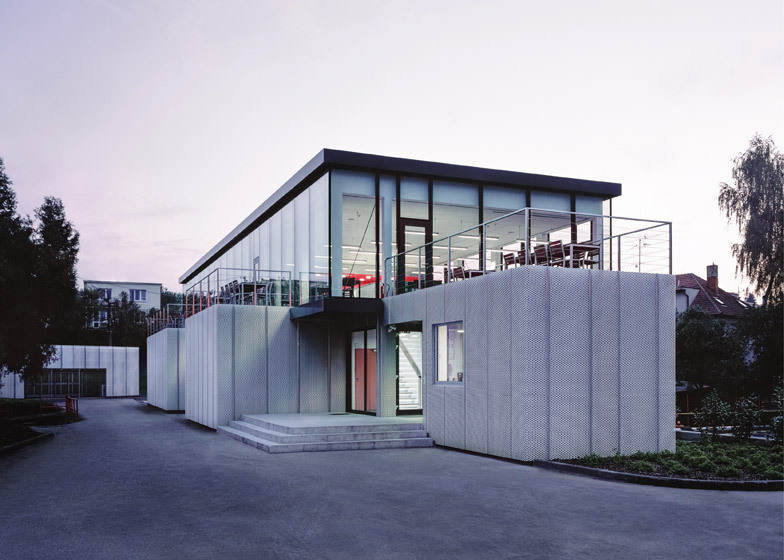 Located on the outskirts of Czech town of Vizovice, the facility provides a showroom for KOMA Modular, a firm that specialises in prefabricated modular construction. Prefabrication involves creating the parts of a building off-site and then assembling them in-situ to save time and money. Recent examples of buildings designed to use this form of construction include a school canteen in Spain and a wooden apartment block in Finland. 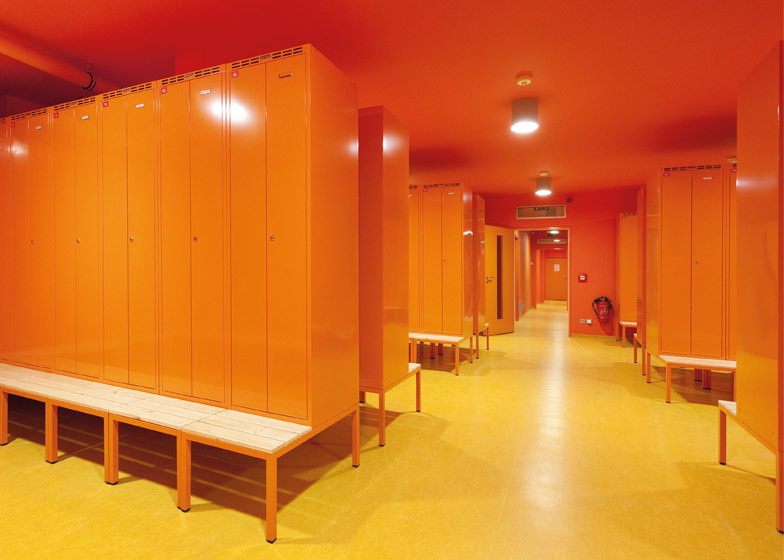 The company is gradually remodelling its production facility, so commissioned Czech firm Chybik+Kristof Associated Architects to create a new building, accommodating changing rooms and washrooms as well as a cafe where staff can eat together in comfort. Using the firm's most commonly produced module, the architects developed a design that combines opaque staggered volumes on the ground floor with a transparent box on the upper storey. 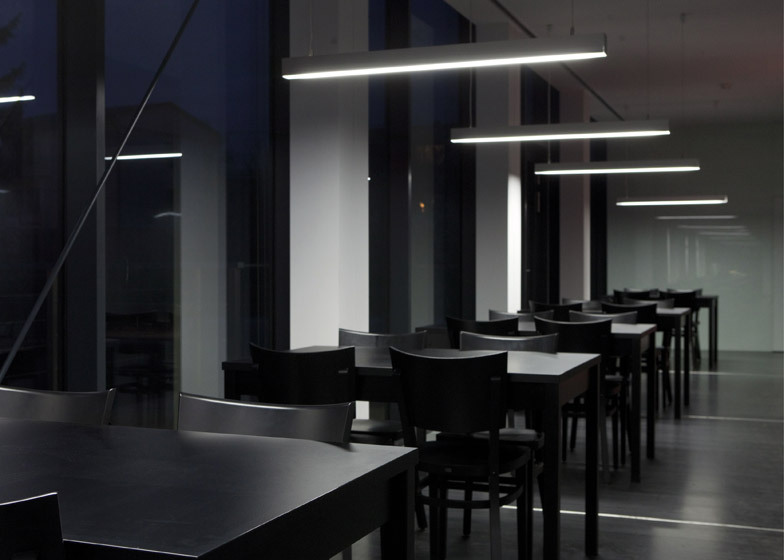 "The whole cafeteria was designed in accordance with the module of nine metres by three metres, and it is this limitation which determines the aesthetics of the building, together with the operating scheme," architect Ondrej Chybik told Dezeen. "To achieve the clarity of the modular structure, we chose an identical size of the modules for the whole construction." The ground floor houses the changing areas. Here, the modules are staggered to emphasise the sense of the building being constructed from individual units. The irregular arrangement also allows the rooftops of some of the modules to be used as terraces for the cafeteria above. 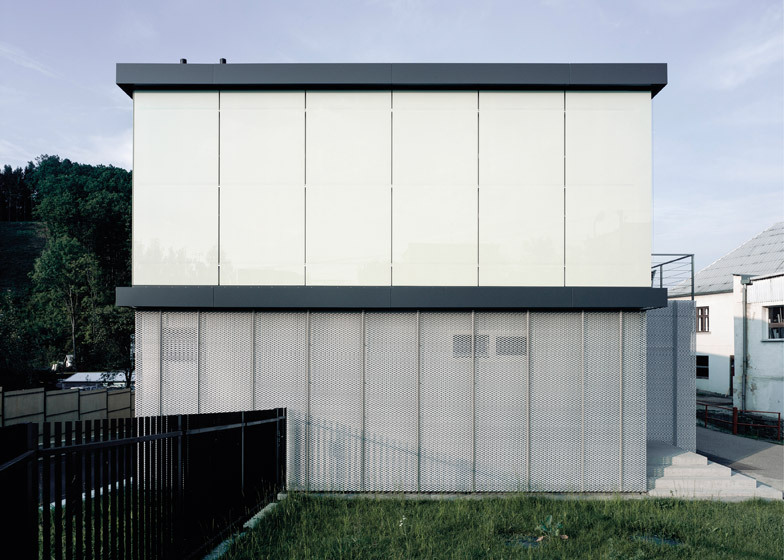 Expanded metal mesh was applied to the external surfaces of the lower storey, uniting the identical masses that combine to form the building's base. The mesh surface also extends across some of the windows, allowing in natural light while providing the changing rooms inside with some privacy. 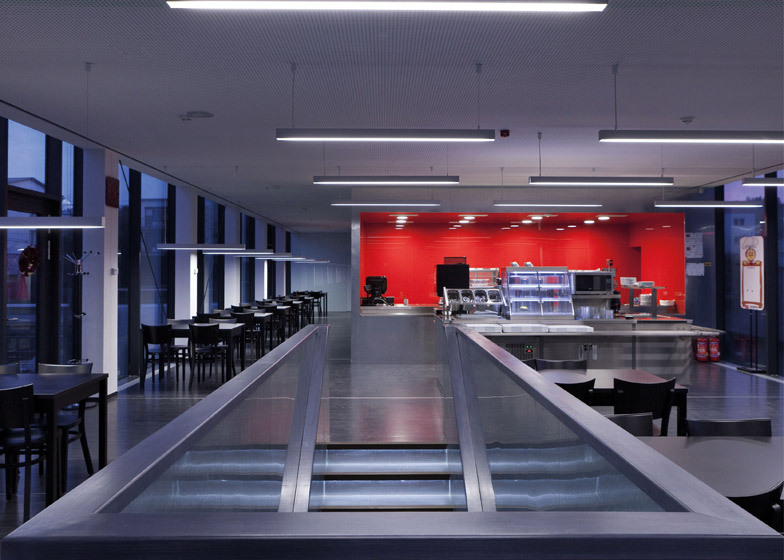 The upper-floor cafeteria features glazed walls around three sides of its four walls. The dining area is left completely open plan to make the most of the light and views from the full-height windows. Elsewhere in the building's interior, surfaces clad in galvanised sheet metal reference the material used to produce the modular structures. 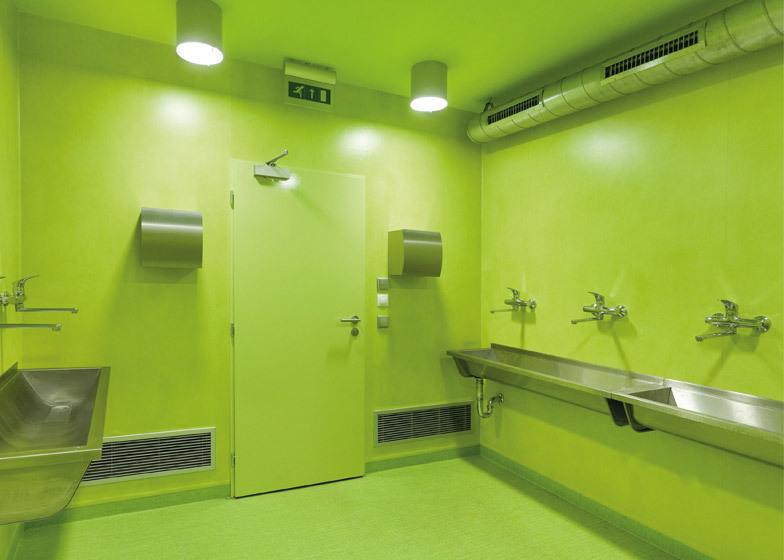 Brightly coloured walls, ceilings and floors in the changing rooms and washrooms contrast with the otherwise raw and industrial material palette. According to the architects, the main advantage of building with these prefabricated units is the speed of assembly facilitated by the integration of internal partitions and all mechanical and electrical services during the production process. "Almost immediately after the excavation and foundation works on the building site have been finished, the final modules are ready to be assembled as a construction set," Chybik explained. The duo believe the project demonstrates that using prefabricated modules can produce unique and progressive architecture. "From the beginning we wanted to provide more than a mere composition of prefab steel modules and glass walls," added Michal Kristof. "We sought to design real architecture out of the available components." Following on from the design of the cafeteria, the studio was commissioned to use the same modular components to create the Czech pavilion at the ongoing World Expo in Milan – where projects on show include a dragon-inspired pavilion and an indoor forest. Photography is by Marek Malusek, unless stated otherwise.